* * Note: has a collar set (MILI collar). If you want to purchase the two pieces, we inform you beforehand to deactivate the shipping costs on ETSY, which will run to our account. 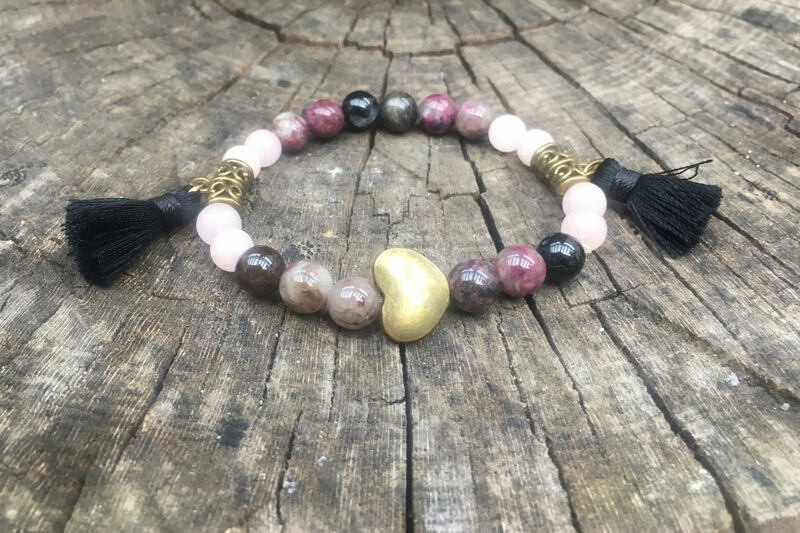 Bracelet with pink-green agate beads (6mm) and purple-green-black (6 mm) Tourmaline with bronze beads and small pink/black tassels (to choose). Belonging to the group of silicates with crystalline structure in rings, its chemical formula is very complex. The Tourmaline family brings together several species that share the same crystalline structure. And in nature are presented in various colors. It's a tough mineral. The most abundant tourmaline in nature is the black, plover, an opaque mineral with iron. It absorbs negative energy and dissipates stress. It connects with the Earth's energy. Protective Force. It eliminates the pain. Other tourmalines according to their color, are: Indigolita (blue), Verdelita (green), rubellite (pink or red), dravite (brown, brownish) and Acroíta (colorless). They also exist with chromatic variety. The Rubellite, is a symbol of passion, is one of the most positive stones. Inspires confidence in love. Attracts positive energy and health, dissipating emotional pain. Zodiac sign: Aries, Taurus, Gemini, Cancer, Leo, Scorpio, Sagittarius, Capricorn and Aquarius.